When one talks about laptops, the general idea is this: laptops are not meant to function as a gaming machine, unless stated otherwise. The thing about gaming laptops is this, they tend to be rather bulky and are great power guzzlers due to the kind of powerful hardware packed underneath the hood. Razer decided that you can have the best of both worlds through the introduction of the Razer Core V2. The Razer Core V2 is able to transform highly mobile Thunderbolt 3 laptops into a portable, desktop-class gaming machine where all it requires would be a solitary Thunderbolt 3 (USB-C) connection in order to hook up your existing laptop to this graphics enclosure. Chances are, after you have hooked up the Razer Core V2 to your laptop, the bottleneck would no longer be in the video card department. Rather, it would most probably be the processor, hard drive, or even lack of memory that causes gaming performance to drop. 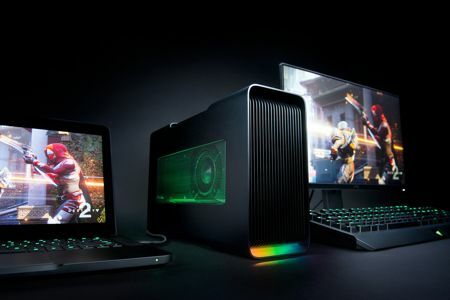 We say this because the Razer Core V2 boasts of the world’s first dual Thunderbolt 3 internal controller design which will sport separate lanes for graphics and connected devices, delivering fluid gameplay. This external graphics enclosure will be accompanied by a quartet of USB 3.0 ports as well as Gigabit Ethernet in order to hook up a wide range of different peripherals. Made from a block of durable raw aluminum, the chassis is CNC precision milled in order to deliver a very compact form factor. It comes with its own 500W power supply in order to deliver a right amount of power when it comes to graphics and connected devices, while extra cooling fans have been built into the design to help dispense heat quickly in order to achieve an optimal level of performance. It can fit an expanded range of taller graphics cards, including support for the NVIDIA GeForce 10 series and AMD Radeon 500 series with XConnect technology. The Razer Core V2 will retail for $499 apiece and is currently available for purchase.